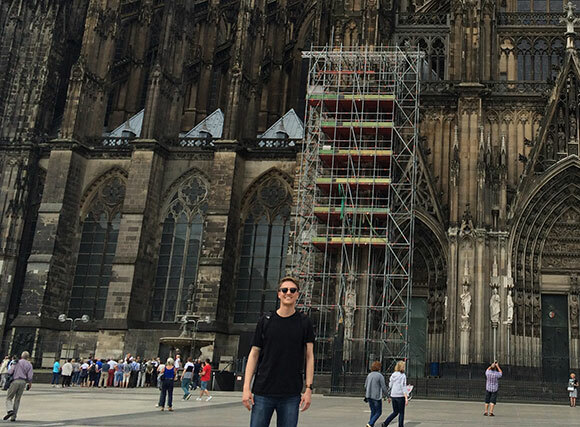 Scott Copeland at the Cologne Cathedral in Germany. Scott Copeland time in Germany didn’t just help him improve his language skills—it also helped him shape his senior thesis. A sociology major from Fort Mill, South Carolina, Copeland is researching the German-speaking population of Belgium and their sense of European, national, and regional identity in the midst of an environment with significant multicultural influences. During his time studying at the Carl Duisberg Institute in Cologne, he noticed abundant cultural differences. Since returning to the U.S., the senior said, that type of cultural knowledge has caused him to be a more informed observer of international political and social issues—including Germany’s lead role in welcoming refugees fleeing civil war in Syria. Beyond his thesis, Copeland—who has a minor in business economics—hopes to remain attuned to German and European issues and cultures, whether academically or personally. “It’s definitely something that I want to continue to be involved with throughout the rest of my life,” he said. Though their experiences varied greatly, a near constant amongst SLA participants is a desire to return to their host countries. Copeland is currently writing his senior thesis and hopes to return to Europe eventually, either in pursuit of another academic degree or in his career. The students agreed that their SLA experiences have made an impact on their studies at Notre Dame as well. For Nwadiuko, China remains on his mind as he continues his pre-health coursework. Shortened version, originally published by Tessa Bangs at al.nd.edu on December 02, 2015.